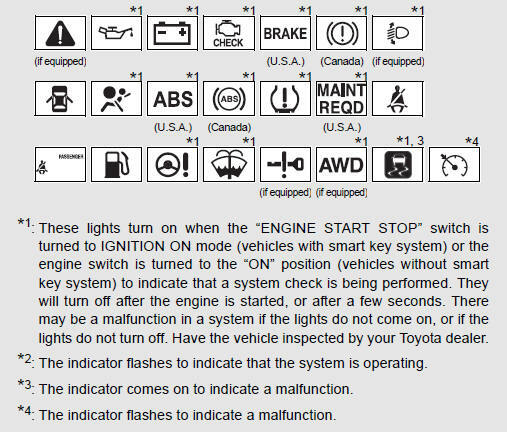 For the purpose of explanation, the following illustration displays all indicators and warning lights illuminated. Warning lights inform the driver of malfunctions in the indicated vehicle’s systems. Should a safety system light such as the ABS and the SRS airbag warning lights not come on when you start the engine, this could mean that these systems are not available to help protect you in an accident, which could result in death or serious injury. Have the vehicle inspected by your Toyota dealer immediately if this occurs.